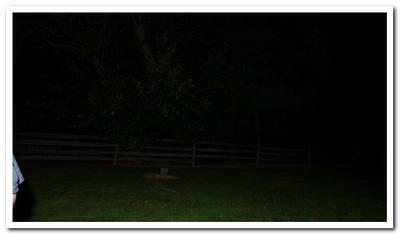 These pictures are from the night of Ghost hunting on the Gettysburg Battlefield at the "Old Alms Cemetery". August 15, 2015. Taken T 8:50 pm. Weather was clear and in the 70's. We were taking EVPs and flash pictures in this cemetery. We were all alone and nobody else was with us. I didn't realize that this appeared on my picture until I was home going over them. You will see the orginal picture, one that had the back ground lighten from my photo editor, a chose of the union jacket and then of the arm. 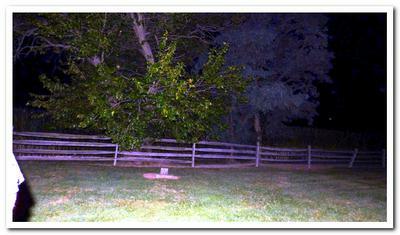 We been going ghost hunting for over 2 years now and mostly on the Gettysburg Battlefiield. Best one yet. I have been still working out what is being shown in the pictures? We have decide after doing some looking closer with my reenactor friend, that what I believe to be an arm is really the butternut pants that a Confederate soldier would wear. So the final decision is that it is a rebel soldier with no arm shown out of the sleeve of the jacket. The bottom part is the pants. I have reviewed the picture of the jacket with my friend which is also an reactor as a Union General. He said that it appears more to be a rebel over coat. A Yankee jacket, it would be a darker blue. If my grandson and I would have seen this with our eyes instead of a camera, I don't know if we would have stayed any longer in the cemetery? I have personally see spirits, but never in complete form as this and actually leaving a shallow. I have seen dark shallows before, but not like this time.